The American College of Sports Medicine recommends raising your cardiovascular activity to between 60 and 90 minutes a day a minimum of three days per week if you want to lose weight. Two of the most popular ways to fit in these workouts are the elliptical machine and the treadmill--but which one gives you the best calorie burn for your time? Elliptical trainers incorporate two styles of movement in one machine--stair stepping and rhythmic striding, as in cross country skiing. Some elliptical trainers have poles that you can hold onto and move back and forth during your workout to increase the calorie burn and total body aspect of the workout. The amount of calories you burn in any given elliptical workout depends on the setting of the ramp height, resistance level and the speed at which you move your legs (stride speed). Because your feet never leave the pedals, the elliptical provides a low-impact workout that is friendly to your joints and back. 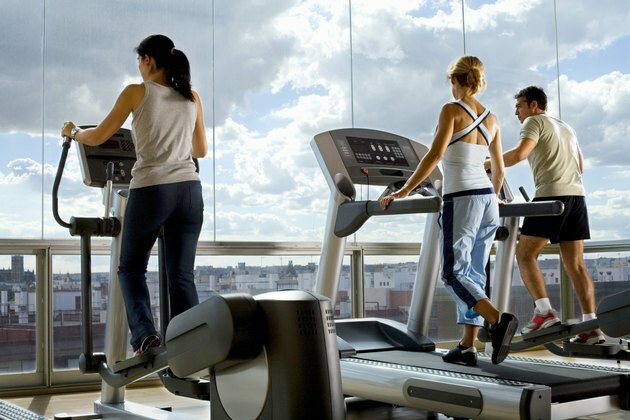 A treadmill allows you to walk, jog or run indoors. Speeds on the treadmill range from 1 mph to as much as 15 mph on some commercial treadmills. The ramp of the treadmill may also be adjusted from a 0 percent incline to about 15 percent. Some specially designed commercial treadmills provide as much as a 35 percent incline and even allow for downhill training with a minus 3 percent grade. The amount of calories you burn in either exercise depends on how hard you work, how efficient you are at the exercise and how much you weigh. Beginners at any activity always burn more calories than someone who has trained her muscles to efficiently move. A 150-pound woman working at a moderate intensity burns between 250 and 300 calories in a half hour on the elliptical. This means you are seriously working, however--breaking a sweat and raising your heart rate to about 70 to 75 percent of maximum. Using an elliptical with arm poles burns more calories. The average 30-minute run on a treadmill for a 150-lb. person going approximately at a 10-minute mile pace burns about 300 calories. Running on an incline amps the calorie burn. An elliptical trainer is a good choice for beginners or for those who have significant weight to lose. Because you can adjust the resistance to meet your needs, you can work at the highest level you can without putting pressure on your joints. The upright position you hold while on the elliptical also helps the back stay strong and avoid strain that might occur with the impact of running. Although the treadmill has the potential to scorch calories, it largely depends on your speed and time committed to running. You have to build up to a certain cardiovascular and strength level to run for any duration. Beginning runners should walk or jog first in order to ease into running's intensity, or they risk developing shin splints and joint pain. Walking burns significantly fewer calories than running, unless you add big hills or work in speed intervals. If you're a seasoned exerciser who runs and adds inclines, the treadmill offers the most calorie burn because you're supporting your own body weight. However, the elliptical--if used in an aggressive manner with the arm poles--comes pretty close to the treadmill's calorie burn. The few extra calories you might burn on the treadmill, however, come with a greater potential for injury. Consider incorporating both modalities in your regimen to reap the most benefit. Cross-training in this manner helps you avoid boredom and injury while sticking to a routine that can only accelerate your weight loss progress.